What does it mean to be out of your comfort zone? Fritz, over at The Retirement Manifesto, just wrote a really inspiring post called Living Life At The Limits. I love reading different bloggers in the FI community. Ever since I quit my job (others call it retiring! ), I’ve been trying to keep growing, which means doing things that scare me. For many people, these are physical challenges, outdoor sports, marathons, or polar plunges. For me, I get that feeling when I do something silly. 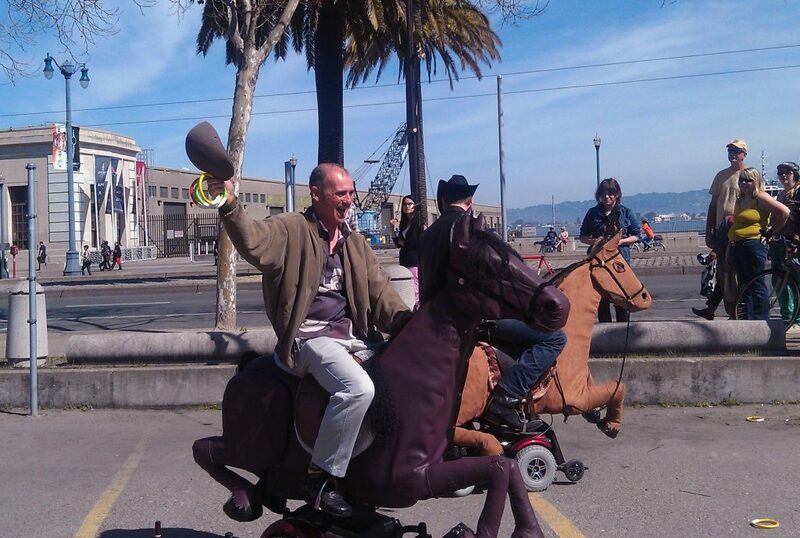 My husband Matt is definitely in this category as you can see here riding this “pony” at the San Francisco Exploratorium. So what does all this have to do with Financial Independence? It has to do with being willing to do things that are abnormal, to “stand out”. 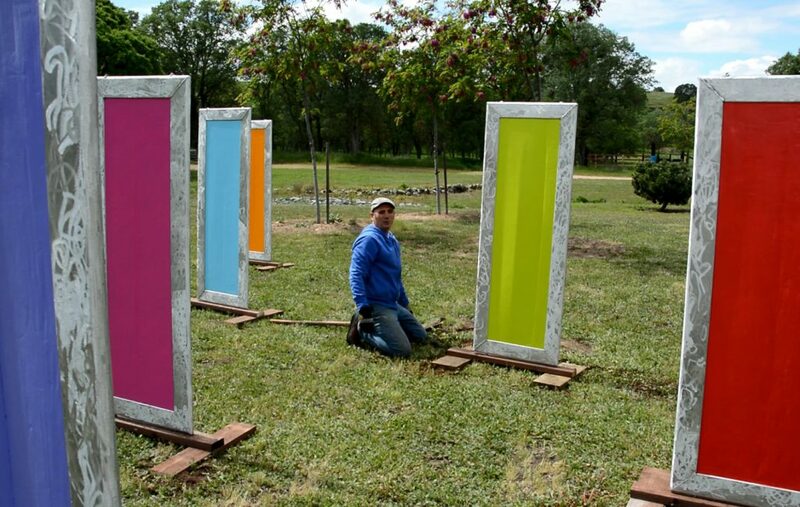 On this note, and as art dabblers, we decided to enter this into the Oakwilde Ranch and Sculpture spring show and we titiled it “Standing Out”. 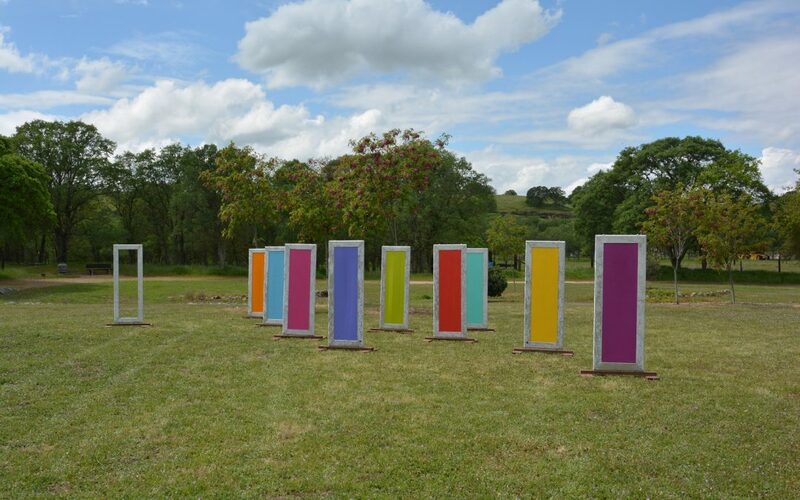 This installation is inspired by color and explores the choices we make between conformity and self-expression. The use of strong color often frightens people, but at the same time, they love it. Wearing bright, bold colors could make you admired or ridiculed. It requires courage to create your own fashion. We have found happiness stepping out of the comfort zone and exploring the possibilities that color can bring. We like to say “Get busy living or get busy tie-dying”. As you can see, we are often asked by friends, Are You Crazy??? Clearly, the answer is YES!!!!!!!!!!!!!!!!!!! The hunt for content starts now. Blogs remind me on old fashion “Newsletters” usually rich at the start and than becoming more and more laborious. One is got to apsoluteky love the blog maintenance not to call it just another “job”. I am looking forward the continuum. Good luck. Thanks Kreso. If you check my “About” page, you’ll see I’m not looking for a J-O-B! The idea here is just the opposite. Money is simply a way to buy bits of freedom. That’s what I’ve done and now I’d like to just have this website to point my friends and family to the brilliant people out there who are interested in keeping up this type of content. I enjoy chiming in. You have to admit, those articles from The Retirement Manifesto are really inspiring. I just found you on twitter as well. I enjoy the twitter feed because the articles people are writing have a lot of ideas that I haven’t thought of before. It’s great to be part of this community of people. You have an impressive start on your FI path for being in your 30’s. I’ll check out your blog at Tread Lightly Retire Early. Thanks for your interest! I don’t think you’re crazy, it sounds like you guys have a ton of fun doing whatever it is you want to do. I find that in life most of the best people to know are the ones that don’t do the regular thing and march to the beat of their own drum. Thanks Time. The beat of their own drum! Perfect for us. 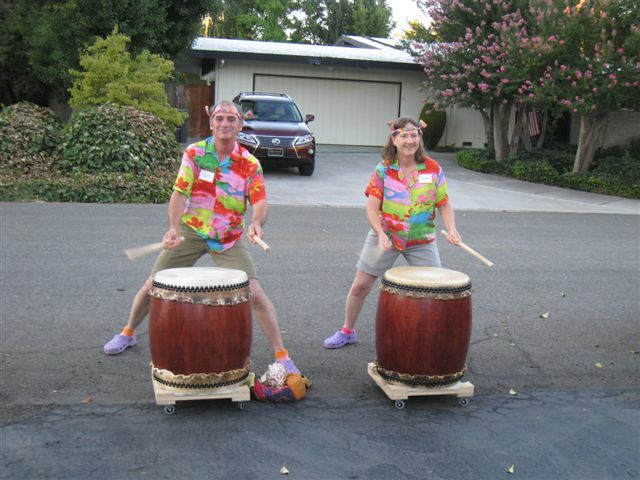 Since you can see we are taiko drummers, I guess that is a pun intended! Great start on the blog. Seems to me that you guys are enjoying the hell out of retirement, and that’s what it’s all about. I semi-retired in October and am coming to terms with my new free time. It’s a work in progress! We are enjoying it! I hate the word “retirement” though. It only defines what you don’t do anymore, which is why I like the term FI. I can tell from your blog that you have lots of great interests like climbing, paddling, cycling, running, snowboarding, hiking, and backpacking. It is hard to get into the new flow of things, but I think you have a great list to choose from. Congratulations making it so quickly, in your mid-forties. You are an example for others. Welcome to the PF tribe and blogging community! Hi Amy! It looks like we are not geographic neighbors, but hey, we FI people travel. I can tell from your blog that we have a lot in common. I love your kitchen remodel, and your focus on all the F-words(as you say!) – Finance, Fitness, Food, and Fun. Thanks for stopping by. I wish we were neighbors too. Hi Susan! Great post. 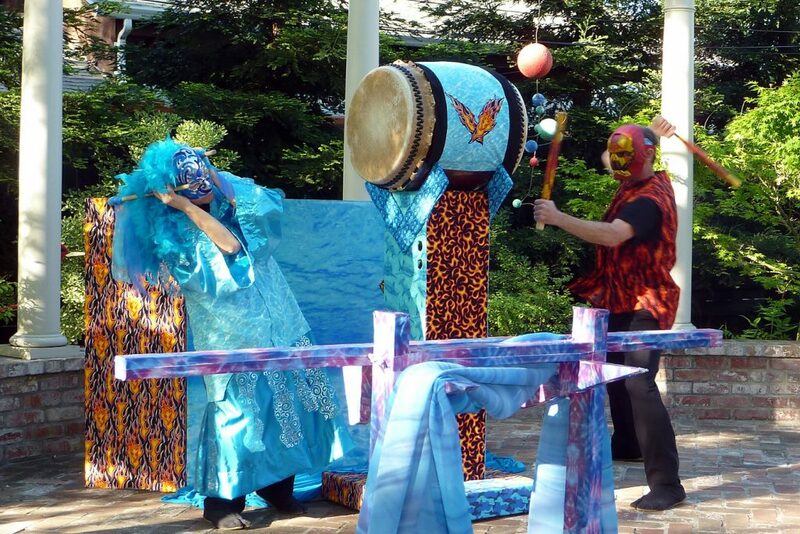 I love the sound of taiko drums! Your logo is awesome. Did you draw it? Hi Jim! 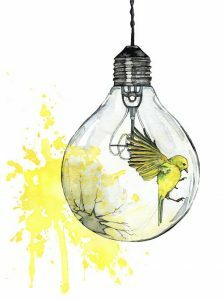 Glad you like the bird in the lightbulb watercolor. I actually purchased the rights to use it from an artist on Etsy. It is a beautiful and interesting image. Thanks for stopping by. I will check out your blog. It sounds very adventuresome! Susan, I am honored beyond words that my post motivated you to begin this blog!! I’m going to include this article in my “Part 2” post on “Living Life At The Edge”! Great post, you sound like crazy fun people!! Hopefully, we’ll get a chance to meet someday. Thanks for the shoutout, it means the world to me. That is so exciting, Fritz! 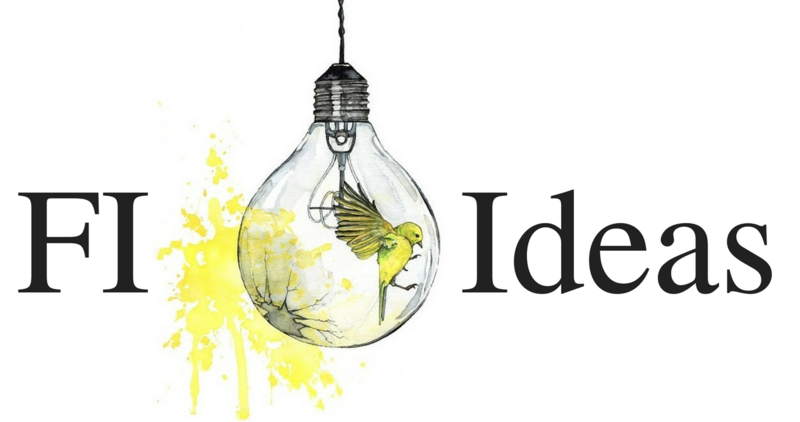 I really enjoy reading your blog and have been particularly inspired by articles like Achieving A Dream. My main goal with the blog here is to connect with the FI community and add my “two cents”. I hope to be able to meet some of the wonderful people out there, such as yourself. In the mean time, I feel we are friends online. I look forward to the “Part 2” article.